POLICE in Redditch say they will be stepping up patrols in the wake of the disorder at the top of Unicorn Hill on Sunday. 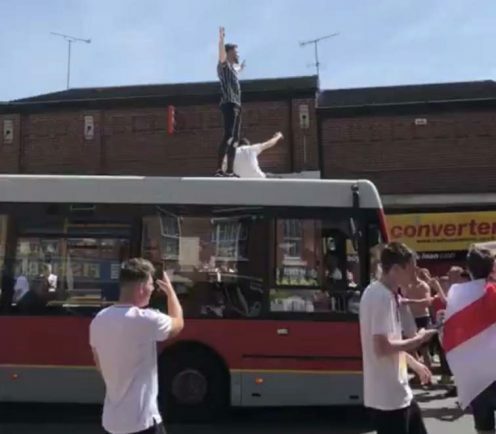 Following England’s 6-1 victory over World Cup minnows Panama a crowd of mostly young men spilled out on to the street, stopping traffic, including a Diamond Bus, and clambering on to its roof. The driver was repeatedly spat at and youths tried to climb through his window. Then as the driver tried to move on another man climbed on to the back of the bus to ‘surf’ down Unicorn Hill. Police were called to the scene shortly after 3pm on Sunday. Sergeant Mandy Partridge said: “We are aware that this incident followed shortly after the England match and want to reassure residents that throughout the World Cup we have increased resources at peak times, and any disorder will be thoroughly investigated. No arrests were made but any witnesses are being urged to contact West Mercia Police on 101 quoting incident 433S of 24 June 2018. During the incident terrified shop workers and pedestrians had to run for it as the mob spilled out onto the street. One man, who had gone to collect his wife from work said: “It was absolutely disgusting. “I want to know where the Police were. They knew it was a 1pm kick off, they knew people would have been drinking all afternoon and yet there wasn’t one of them about to keep order. Chris Bridges, operations manager at Diamond Buses said: “I’m horrified and I’m ashamed and I’m very angry. “This behaviour is totally unacceptable – my concern was for the driver and passengers and other road users. “The driver was repeatedly spat at, which is absolutely disgusting. “And then what if the guy who jumped on the back of the bus had fallen off – he could have died. “I’m mortified that they put people in danger and themselves in danger. “I’m a football fan, I love football, but to celebrate by attacking a bus, trying to spit at the driver and try to jump through the window.